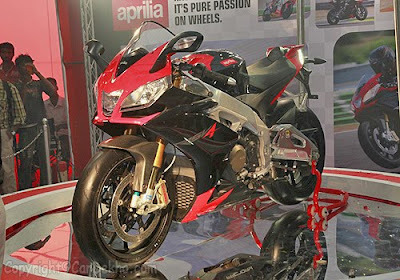 A well known manufacturer of Italian super bike is Aprilia. It is very popular because of its beautifully designed machines and technologically advancement. In the global market, Aprilia manufacturer holds very crucial share and it is considered as the fourth largest manufacturer of the world. Today, so many super bike manufacturers such as Honda, Ducati, Harley Davidson, Suzuki, Yamaha etc. are introducing new models in the market day after day. So, it becomes important for Aprilia to introduce a new model of super bike to the market to keep itself in competition. 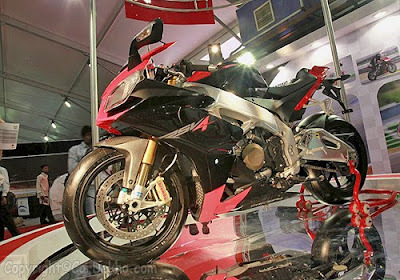 On 20th January, 2011, Aprilia is launching its new model of super bike known as Aprilia RSV4 Factory in the global market of super bikes. In India, it is expected that it will cost you around 18 lakhs rupees. It is expected that Aprilia RSV4 Factory will offer a number of brand advancements to compete with other super bikes already present in the Indian market. Displacement of engine if Aprilia RSV4 is (60.91 cubic inches) 999.6 cc and the type of engine used is four stroke cylinder V4. The power produced by the engine of Aprilia RSV4 is 132.4 kw at 12500 rpm. The torque produced by this bike is 115 Nm @ 10000 rpm. The compression of Aprilia RSV4 is in the ratio of 12.8:1. There are 4 valves per cylinder in the engine of this motor bike and the bore and stroke is of 78 mm × 52.3 mm (3.1 inches × 2.1 inches). The fuel system used in Aprilia RSV4 in injection type and it is integrated with electronic engine management system. There are 8 injectors, 4 throttle bodies, air box and indirect multipoint electronic injections in this model of super bikes of Aprilia. Electronic digital ignition is integrated in the fuel management system of Aprilia RSV4. It consists of 6 gear box speed. Double trochoid pump with the oil cooler is used in the lubrication system of the Aprilia RSV4. In oil bath of this new version of motor bike, multi plate clutch is used. A dimension of front tire of Aprilia RSV4 is 120/70-ZR17 and rear tire is 190/55-ZR17. Front compression of this super bike is with external adjustment system for compression, preload and rebound, 43 mm titanium nitrate coated upside down fork. The rear suspensions of Aprilia RSV4 is double arch aluminum swing arm and adjustments for rebound, spring preload, length and compression is made.